We’ve all been fouled in a pickup game, but this guy called 911. According to @_togs, the man in black standing to the officer’s right called the police after he was knocked down by a stiff screen. The screen was set by the man in the arm sleeves, and according to the account of the incident it wasn’t even that bad — just an aggressive screen, which was a borderline foul in the first place. But the whiny dude got so upset he decided to call the cops. 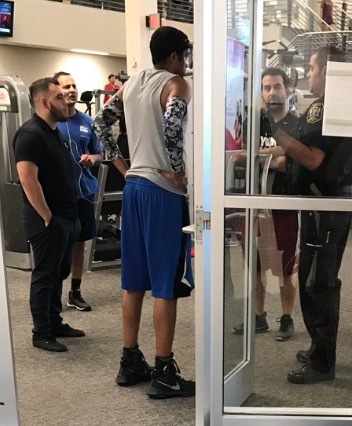 The officer did not charge anyone and explained why he wasn’t doing anything over being called out to a gym after a dude had his feelings hurt. It’s unclear what the dude hoped to gain by calling the cops. In order for a reasonable assault charge to be leveled there would need to be evidence that it was an intentional act designed to cause injury, which doesn’t sound remotely the case when it comes to an aggressive screen. Snowflakes! Stop calling 911 over every little thing! Like not enough pepperoni on your pizza!